Golden Earth is a non-profit organization that promotes eco friendly practices in community level in association with schools, nature clubs and other organizations in this niche. Denise Poley, the main hand behind this campaign needed a custom gift that will spread awareness and bring a quality change in the life style of people in connection with Earth Day. 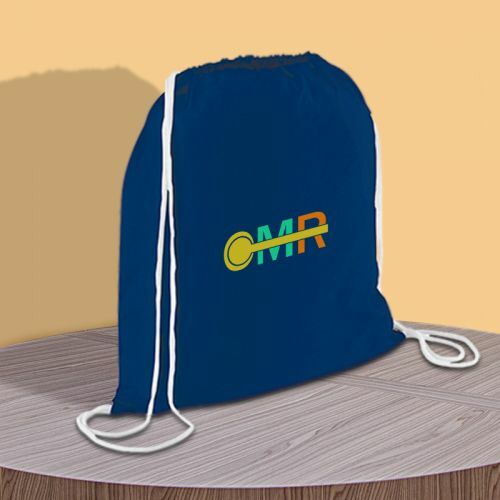 We suggested Condor Cotton Drawstring Backpacks as a possible gift choice because firstly bags are one of the top 5 promotional items. Secondly bags are used by everyone irrespective of gender or age differences. Most importantly, Condor cotton bags that are made of cotton will not add up to the landfills and perfectly matched the theme of Earth Day as well. The handy instant quote feature of ProImprint that allowed the users to find the total cost for the quantity they wish to buy for different colors or imprint methods made it easy for Denise Poley to shop easy while staying within his budget. He chose these popular cotton drawstring bags for its affordable price and simple daily use features. He wanted a bag that should be sturdy enough to carry the daily essentials and easy to maintain. The drawstring backpacks must be ideal for the daily grinds for the recipients – be it work, play or nature trips. He appreciated the generous imprint area that will make his message and logo well seen even from a distance. Color red was chosen because he wanted to sound an alert to everyone to make necessary changes in their life styles before it is too late to make Earth a better place to live. Condor Cotton Drawstring Backpacks are made from eco-friendly 4 Oz cotton canvas. Secured with a drawstring rope closure, these backpacks expand and allow lots of room for managing the daily essentials including water bottles, sunglasses hiking gears and more. These natural cotton backpacks perfectly highlighted the ecofriendly niche and the social commitment of Golden Earth. Denise Poley’s organization placed an order for 2,000 bags to be given out to schools, nature clubs and other organizations working in eco friendly endeavors. At a time when environmental pollution and green house effect has hit a level that could spell doom to all living forms on this planet, these thoughtful gestures like that of organizations like Golden Earth will go a long way in enhancing awareness. NB: The thank you mail from Golden Earth that we got yesterday had a bit of surprise as well. They are planning to suggest the same product to the local school during the upcoming drive of planting saplings. We are happy that the awareness campaign was a huge success. We at ProImprint join the team of Golden Earth in spreading the awareness of the importance of being ecofriendly and adopting a sustainable developmental model during Earth Day and beyond. Till we come up with yet another edition of promotional product success story, happy shopping!